CareerSource Gulf Coast, in collaboration with the Bay County Chamber of Commerce, Gulf Coast State College, Employ Florida, and the American Job Center Network, is holding a free job fair for those affected by Hurricane Michael. This event is weather permitting and will take place on the Hwy 77 side of the mall near the main entrance. Those looking for employment should come “dressed for success” and bring copies of their resume and contact information if able. 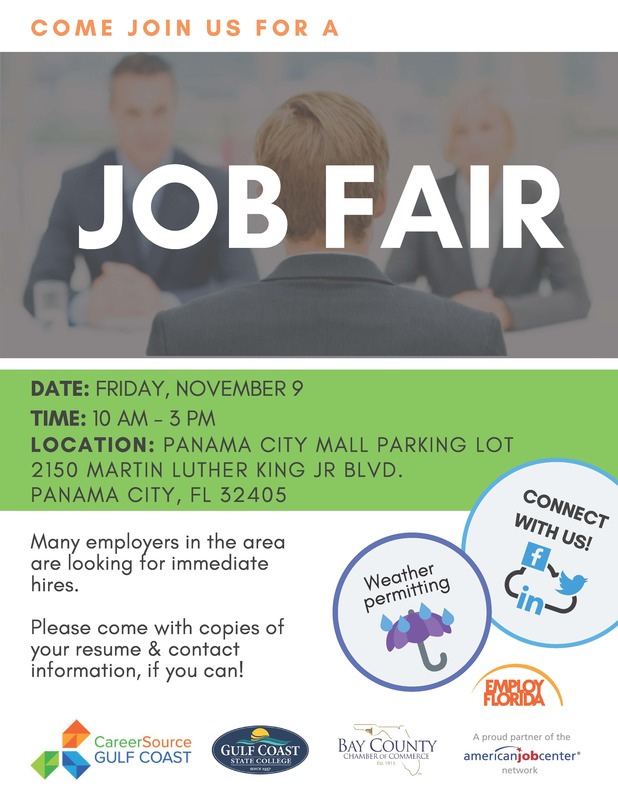 Employers looking to participate in the event should contact Kathy at (850) 532-1332 no later than Thursday, November 8, at 3 pm. Employers will need to bring their own table, chairs and tent, and be set-up before 10 am. For more information about CareerSource GC or the event, visit https://www.careersourcegc.com/.